Flowers can be an essential part of your wedding celebration, and you want to make sure that the florist you pick helps you realize your visions for your wedding. With the right knowledge behind you, hiring the perfect florist is easy to do. First things first, come up with a budget. Before looking for a florist, try to determine a floral budget. Try to keep this number a little flexible, since you won’t know how much the flowers you want will cost until you start getting estimates. Having a predetermined number will help the florist know what you can afford when you sit down and discuss your flower selections. Word of mouth is the best advertising. Also ask your ceremony and/or reception sites about florists that they have worked with in the past. Visit several florist shops to see how their store runs and appears. This will give you a chance to see how they greet you, and how they treat their customers. Is the shop neat? Is it organized? Take a look at their flower selections and check their quality; are they fresh? If the shop is messy, the flowers are droopy, and they are rude to you, you should definitely check out other shops. Make a preliminary flower list of what you think you’ll need. This list will include the number of bouquets, boutonnieres, corsages, arrangements, etc. that you will need. This information will be very helpful to your florist. Sit down with several florists to discuss your flowers. If you like what you see inside the shop, then your next step should be to sit down with the florist to discuss what type of flowers you would like. To help the florist determine what you are looking for, try to bring pictures of your dress and the bridesmaids dresses, as well as photos and magazine clippings of bouquets and flower arrangements that you like. 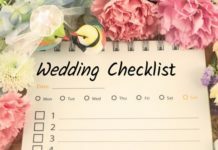 Sometimes florists will ask for swatches of material from the bridesmaids dresses or your gown, so bring along some swatches as well, if possible. Ask if the florist has photo samples that you can look at. Most florists will keep photos of their work to show other prospective customers. This will give you a feel for their quality of work, plus you might see an arrangement that you might want for your own wedding. After telling your florist the things that you want, ask for suggestions. A good florist should be able to make suggestions to help compliment your wedding while still trying to stay within your preferences. Get everything down in a contract. Once you’d decided on a florist and have agreed to the price, you will probably have to sign a contract. Make sure that all agreements are spelled out in the contract. This would include the date, time and place of delivery; number of flower arrangements agreed upon (number of bouquets, corsages, bouts, etc. ); and the type of flowers in each arrangement. You want to make sure as much information is on the contract as possible, to protect both yourself and your florist. Read through the contract carefully before you sign it, and if you have any questions, ask before you sign. The contract will probably also state the payment arrangement as well.